Myocardial infarction treatment attempts to save as much myocardium as possible and to prevent further complications. What is myocardial infarction or ischaemic heart disease? Acute myocardial infarction (AMI), commonly known as a heart attack, is the interruption of blood supply to a part of the heart, causing heart cells to die. This is most commonly due to occlusion (blockage) of a coronary artery following the rupture of a vulnerable atherosclerotic plaque, which is an unstable collection of lipids (fatty acids) and white blood cells in the wall of an artery. The resulting ischemia (restriction in blood supply) and oxygen shortage, if left untreated for a sufficient period of time, can cause damage or death of heart muscle tissue. The most frequent cause of myocardial infarction (MI) is rupture of an atherosclerotic plaque within a coronary artery with subsequent arterial spasm and thrombus formation. 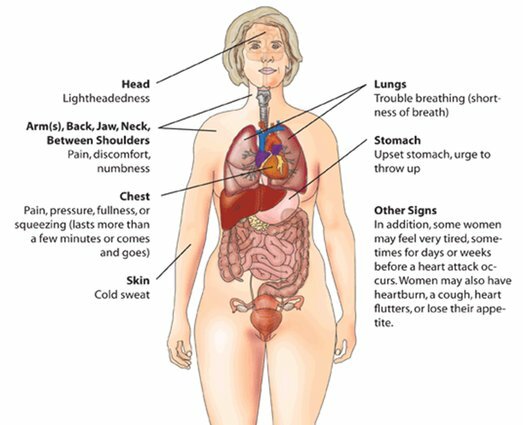 Hypoxia due to carbon monoxide poisoning or acute pulmonary diseases. Coronary artery emboli, secondary to cholesterol, air, or the products of sepsis. Arteritis ,aneurysms of the coronary arteries. Increased afterload which increase the demand on the myocardium. sudden chest pain (typically radiating to the left arm or left side of the neck). Diabetes (with or without insulin resistance) - the single most important risk factor for ischaemic heart disease (IHD). Family history of ischaemic heart disease (IHD). Age: Men acquire an independent risk factor at age 45, Women acquire an independent risk factor at age 55. Alcohol Studies show that prolonged exposure to high quantities of alcohol can increase the risk of heart attack Males are more at risk than females. 1). Provide cardiac resuscitation and to keep the patient alive. 3). Treat life threatening problems. 4). Remove pain and suffering. 5). Preserve as much myocardium as possible by dissolution of Blood Clot or Thrombus, Blocking Lumen of Coronary Artery. In this stage patient is in severe pain, he is at risk of sudden death. 8.if there is cardiac arrest then cardiac massage and artificial respiration. In these cases patient and family must understand what is happening. Treatment should be conducted in coronary care unit. 2.Treatment of failure of function of pump of the heart. In case of lethal arrhythmia, constant monitoring of the heart rhythm allows instant recognition of ventricular fibrillation and its electric conversion using direct current shock. Paddles are placed in front and back of the chest and a current is passed through the chest usually about 300 joules. This electric conversion should be followed by drugs. Treatment is difficult. Diuretics can reduce the breathlessness by lowering the filling pressure of the heart. Forward flow can be improved by drugs which make the heart beat more strongly or drugs reducing peripheral resistance. Occasionally counter pulsation is used when a long balloon is placed in the aorta. It is inflated during diastole, increasing arterial pressure and coronary perfusion. It is deflated during systole, reducing systolic pressure and hence reducing the work of the heart. Clotting in a peripheral vein is common among patients. When it occurs in thigh or pelvic veins pulmonary embolism may occur. The risk is higher in heart failure, with extensive infarction, or in patients with varicose veins. The risk should be reduced by early mobilisation and leg exercises. Clotting over the endocardium damaged by the infarction may lead to systemic embolism. Anticoagulation may reduce this risk. Bed rest reduces physical fitness and impairs the reflexes that prevent and undue fall of blood pressure when we assume the upright position. General weakness and dizziness leads to severity of heart attack. Regular exercise and altering the posture of patient help to overcome these problems and improve patient morale. Most patients able to sit up in chair and take a few steps within 24 hrs of heart attack. As the days in hospital pass, exercise increases but the patient must avoid undue tachycardia. Before discharge patient must climb stairs in hospital. Inflammation of the lining of the heart occurs after infarction. This is painful and is reduced by the drugs. Arm and shoulder movements should be encouraged occasionally. Patient leaving hospital should be diagnosed, prescribed by drugs and level of exercise and activities permitted at home and the expected date of returning to work should be given. Digitalis, diuretics, and vaso-dilator drugs to reduce heart failure. Regular exercise improves the exercise tolerance of patients, increases there confidence and well-being. Regular exercise classes given under supervision is useful and economical. It is important in these patients because support plays a important role in these patients who have less chances of survival during the administration to hospital. 1.complete bed rest-up to 2 days. 2.partial bed rest-up to 4 days. 3.up and about-in hospital from third or fourth day for up to 2 weeks. 4.after discharge from hospital: 3 weeks to 12 weeks. 1.to prevent accumulation of secretion in the lungs. 2.to prevent deep vein thrombosis. 4.to teach and encourage relaxation. 5.to explain the purpose of an active rehabilitation programme. 1.relaxation: lying or half-lying, conscious relaxation 10 min approx. Modified physiological relaxation may be indicated. If the patient can learn to relax, the heart rate is reduced and this aids recovery by easing the load on the heart. 2.breathing exercises: bilateral basal breathing- three times. There must be no forceful breathing. This will improve oxygenation of the blood and therefore reduces the demand on the heart. 4.breathing exercises: anterior basal expansion within patients normal pattern- 3 times. 6.breathing exercises: posterior basal exercises- 3 times. The patient is up to sit for 1-2hours per day. Feeding, washing are allowed. 1.to maintain clear lung fields. 2.to increase the load on the heart such that there is hypertrophy of the myocardium. 3.to educate the patient to recognize signs and symptoms of excess exercise. 4.to begin rebuilding the patients confidence. 6.to strengthen leg and trunk exercises. 1.half lying: relaxation- 5 minutes. alternate foot pulling up and pushing down feet circling, q-drill, gluteal contractions. 6.half lying: lateral basal breathing. 7.lying: active exercises and stretching. 9.crook lying should be done 3 times. The patient is allowed to wash, feed, go to the toilet and have a bath-with supervision. 1.To continue promoting hypertrophy of the heart muscle to strengthen trunk and leg muscles. 2.To continue rebuilding patient confidence. 3.To improve exercise tolerance to teach awareness of exercise capacity. 3.stride standing: holding bedrail or chair-knees and hips bending and stretching. 5.standing:arms raising forwards and upwards. 6.walk standing: one hip and knee bending forward and stretching. 9.bend sitting: trunk bending and turning side to side. Home management will be given before leaving from hospital. The patient can progress the exercise a week to 10 days after discharge. Usually patient is advised not to drive car till 4-8 weeks after discharge. This is usually taken in gymnasium. Patients benefit from meeting fellow patients in group. 2.To maintain or improve confidence. 3.To provide support and encouragement. 4.To help reduce risk factors and thereby reduce recurrence. 1.half yard grasp standing-one leg swinging forward and backwards then repeat with other leg. 2.half yard grasp standing: knees and hip bending and stretching. 3.yard standing: arms circling backwards. 4.yard standing: trunk bending and turning to touch left knee. 5.lying:alternate hip and knee bending and stretching. 8.wing stride standing, trunk bending side to side. 10.sitting ,standing up and sitting down. 13.sitting:trunk turning side to side. 14.crook lying-pelvis raising and lowering. 2.increase the length of time for each exercise. Support and encouragement is necessary in Myocardial Infarction Treatment. Golf is a suitable sport to recommend.